Authority: (Schltdl. & Cham.) Engl. 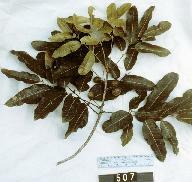 Maya Plant Use: Resin, ritual use, medicine, poison, products and ornamental uses. Botanical Significance: Given the fact that copal (resin) was extracted from these trees and widely used by the ancient Maya for a wide array of ceremonies, it is not surprising that the plant may have been depicted on Maya art. Ritual Significance: Given the wide use of copal in a great number of ancient Maya ceremonies it is surprising that one does not see it represented more in Maya art.